From the latest news to player interviews, here’s your weekly round up of all the latest content from PokerStars Blog. • Human Lie Detector: Can you spot a bluff? Three new shiny $30,000 Platinum Passes were handed out this week, as two Platinum Pass Adventure contents came to an end. Lex Veldhuis awarded his pass live on Twitch. The winner is Benjamin Alvarado, who went to great lengths — or rather cut off great lengths — to help others. Read all about Lex and Alvarado right here. 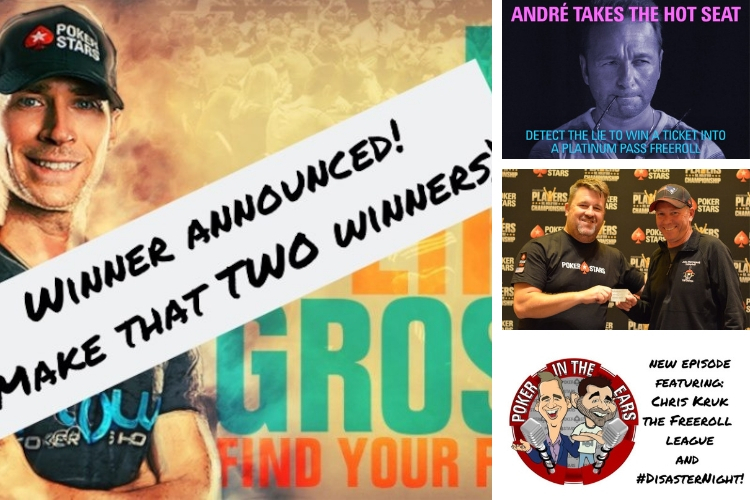 A couple of days later and it was Jeff Gross and Andrew Neeme’s turn to award some trips to the Bahamas and entry to the $25K PokerStars Players Championship. Thing is, they couldn’t settle on just one new vlogger extraordinaire, so they chose two. Congratulations to Matt Keifer and Oliver Biles. Check out all the info, including their winning vlog entries, right here. Of course he did. So get November 9th through 11th on your calendar right now. Friday the 9th and Saturday the 10th are Day 1 qualifiers. Players making it through a Day 1 will converge on Day 2 and play down to a single winner who will, of course, receive a Platinum Pass. And just to be clear: this is not a satellite. There are the usual cash payouts – it’s just that there’s that little $30,000 bonus up top. You’ll find all the info here. Human Lie Detector: Can you spot a bluff? All this talk about people winning Platinum Passes is probably making you want to get in on the action, right? Good news then. If you spot a bluff from Team PokerStars Pro Andre Akkari, you could win entry to a freeroll which awards a $30K Platinum Pass to the winner (as well as $3,000 worth of runner-up prizes to be won). Our Bounty Builder series has proved very popular, so much so that some players aren’t skipping a day. We thought we’d take a look at the players who have scored the most KOs so far. Let’s start with the Team PokerStars Online players. Fintan ‘easywithaces’ Hand leads the way so far with 24 KOs, but it’s Kevin Martin who has banked the most from his bounties with $3,341.89 won. James Hartigan and Joe Stapleton are joined by High Roller and all-round crusher Chris Kruk on the latest episode of the Poker in the Ears podcast. Moreover, they also run through this week’s poker headlines, which include results for Chris Moneymaker and an altruistic Lex Veldhuis fan, and break down the three #PCA2018 Super High Roller TV shows. Plus, there’s more details on the freeroll league. Head here for more info, or listen to the podcast here.